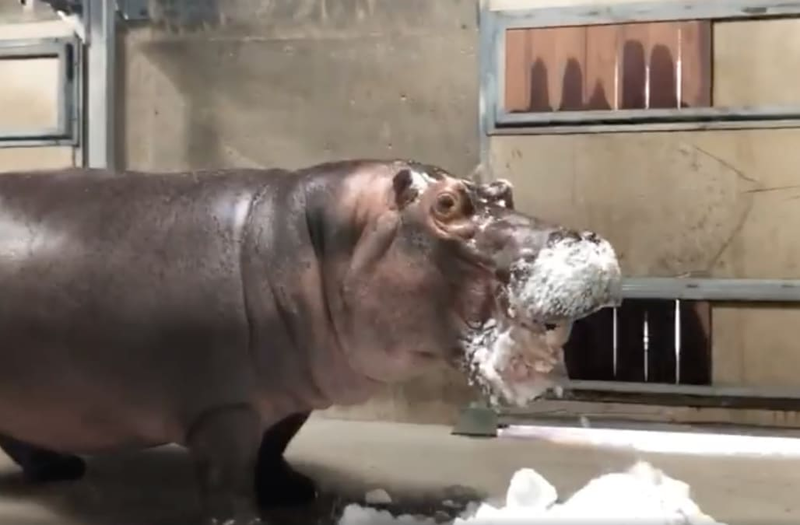 Fiona the Hippo has been introduced to a cold new concept — snow. The hippo, which is thriving at the Cincinnati Zoo & Botanical Garden despite being born premature last year, spotted the white stuff on the ground for the first time Saturday with her mom, Bibi. As Fiona and Bibi stuck their heads in the cold substance, the young hippo was apparently not impressed and walked away, as seen in a clip provided by the zoo. Bibi on the other hand, seemed to love it, giving herself a snow mustache. It should come as little surprise that Fiona did not like the snow, as hippos are native to sub-Sahara Africa and prefer warmer climates, living in lakes and rivers. While Fiona may not have liked the snow, the zoo’s red pandas loved it more than any other animal as officials allowed them to frolic in the cold over the weekend as well. On Monday, the zoo weighed Fiona, and she came in at 649 pounds. She will turn a year old later this month.